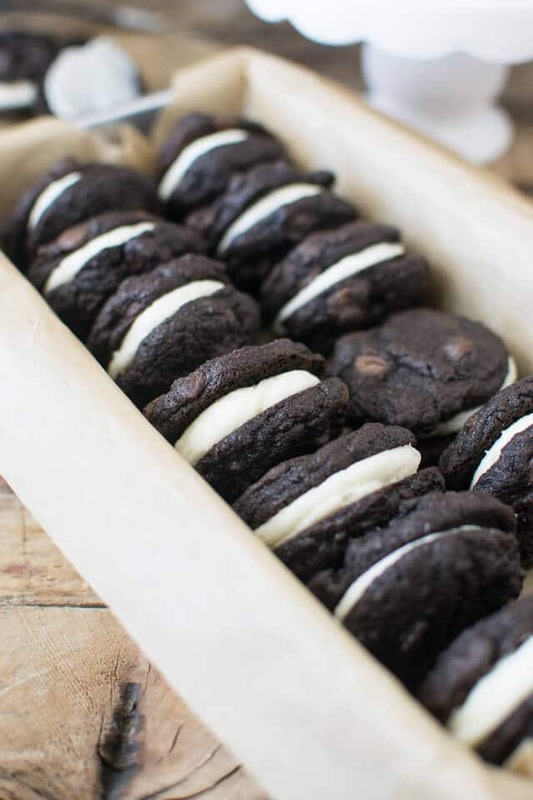 If you love Oreo cookies, you’ll love these rich double chocolate sandwich cookies filled with vanilla buttercream. The soft, yet fudgy texture makes it an amazing homemade Oreo treat! Hello again! This is Sherri from The Well Floured Kitchen. I’d like to know – who is ready for some chocolate? I’ve been working on lots of recipes recently, and they all have that in common. The ultimate chocolate holiday of Valentine’s Day is almost upon us. And of course everyone’s favorite party of the year – the Superbowl. After the nachos are gone, everyone will be looking for desserts to grab and munch on. I think these cookie sandwiches would fit either occasion. Cookies are my all-time favorite dessert. What I love about them is their versatility. They can be dressed up or down, easy or complicated depending on your mood. Sandwich cookies are the best of both worlds. They are a little bit fancier than your average cookie, yet not that many extra steps to make. In no time at all you can be enjoying these! The chocolate sandwich cookies are extra thick plus full of chocolate chips. They use unsweetened cocoa powder and dark chocolate chips. You can use milk chocolate if you’d like. Be sure to plan ahead for these cookies. They cookies will need time to cool before you frost them. Preheat oven to 350 degrees. Line a cookie sheet with parchment paper. If you have a non-stick baking mat you can use that also. You just want to make sure the cookies come off cleanly. Cream together the butter and sugars in the bowl of a stand mixer fitted with the paddle attachment. Scrape down the sides of the bowl. Add in the vanilla and eggs, one at a time, mixing well after each addition. Scrape down the sides of the bowl. In a small bowl whisk together the flour, cocoa powder, baking powder and salt. Add to the mixer bowl, stirring on low just until combined. Gently stir in the chocolate chips. Scoop out balls of dough of about 1 & 1/2 to 2 tablespoons depending on how large you would like the cookie sandwiches. Place on the prepared pan, leaving space between. Cook for 10-11 minutes, the tops will look pale and no longer wet. Allow to cool on the pan for 5 minutes, as the cookies will be very soft. Transfer to a cooling rack to finish cooling. The filling whips up quickly while waiting for the cookies to cool. Simply beat the butter, sugar, vanilla and milk together in a large bowl until creamy. We recommend about 1 tablespoon of filling per cookie, but it will depend on how large you make the cookies. You can use a spoon to spread it onto the cookies, but I found it easier to put the frosting in a Ziploc bag and cut a corner off. The Best Chocolate Sandwich Cookies: Rich double chocolate cookie sandwiches filled with vanilla buttercream. Scoop out balls of dough of about 1 & 1/2 to 2 tablespoons. Place on the prepared pan, leaving space between. Cook for 10-11 minutes, the tops will look pale and no longer wet. Allow to cool on the pan for 5 minutes, as the cookies will be very soft. Transfer to a cooling rack to finish cooling. While the cookies are cooling prepare the frosting. Beat the butter, sugar, vanilla and milk together in a large bowl until creamy. Spoon 1 tablespoon frosting in between two completely cooled cookies. I used King Arthur Flour and Hershey's Special Dark Cocoa Powder. I love that these cookies are more like a brownie–so good! Ok these look AMAZING!!! My husband loves oreos so I’m sure he’d be thrilled with this type of cookie! Cynthia from What a Girl Eats just posted these to FB and I’m so glad she did. They look stunning. They are super good! Very sweet but that’s the point ! The filling does taste like the inside of an Oreo after it sits for awhile! I baked my cookies for 12 minutes and they were perfect ! Another think I did was make the cookies thinner. After they got done baking I squished them down a little bit so they wouldn’t be so fat and they were perfect ! My brother really likes them !! Defiantly a brownie type cookie, it’s so soft ! You’re making me hungry! Now I’m going to have to make them. Thank you so much for your hints! Did you use all purpose flour? You notes just say white flour?? ?